A terrible pun, I know, but one that was too good to resist. Obviously. 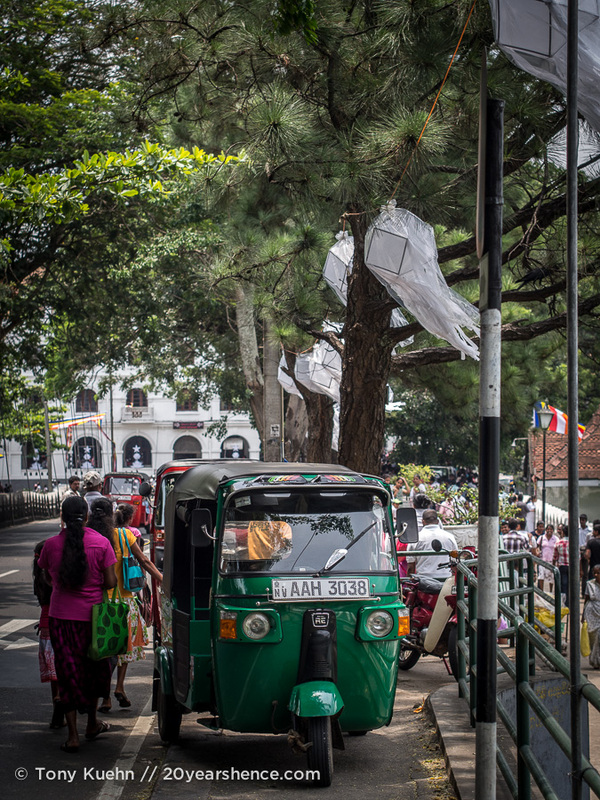 Our penultimate stop in Sri Lanka was the former capital, the city of Kandy. 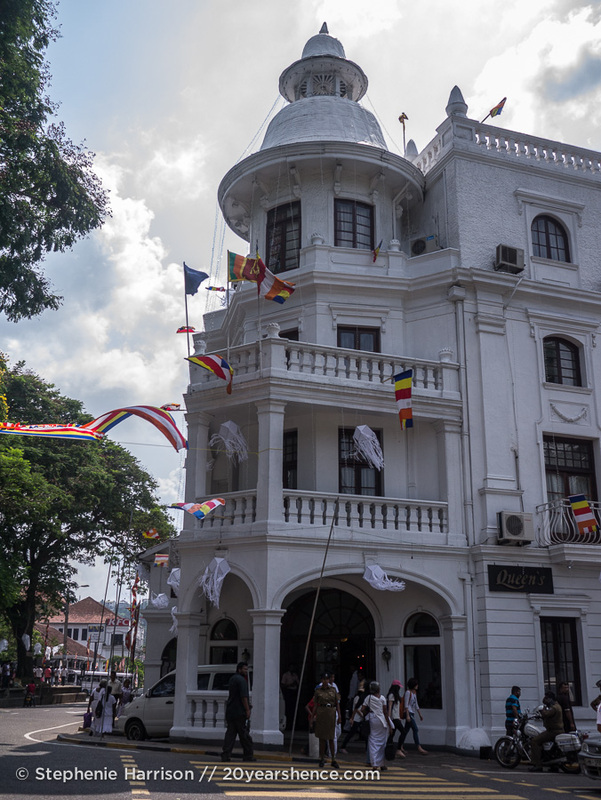 One of the final holdouts against colonialists and conquerors, Kandy was the last stronghold of the Sinhalese empire when it finally fell to the British in 1815. Consequently, the locals are fiercely proud of their lineage and traditions and the city has strong ties to the past and is known as one of the country’s cultural epicenters. 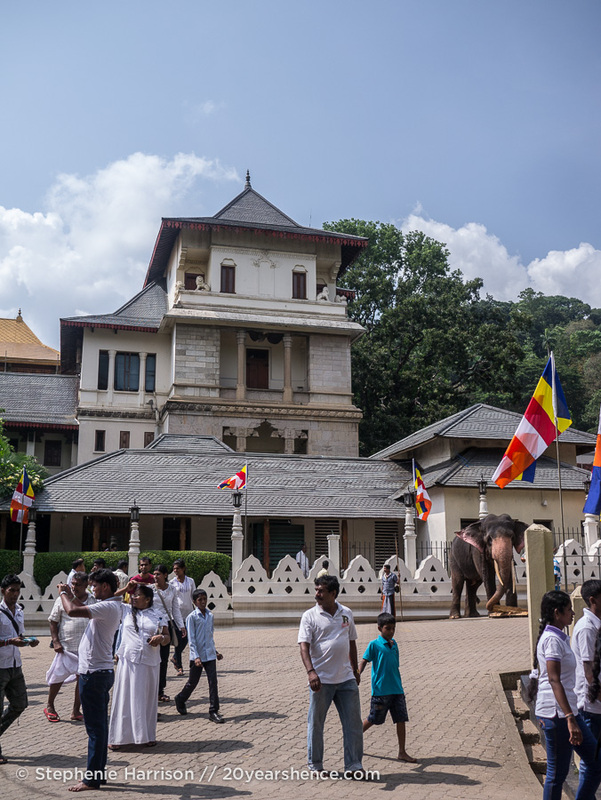 What made our visit especially cool is that it happened to coincide with the annual holiday, Vesak Day, which marks the anniversary of the ultimate Buddhist trifecta: the birth, enlightenment and death of Buddha. 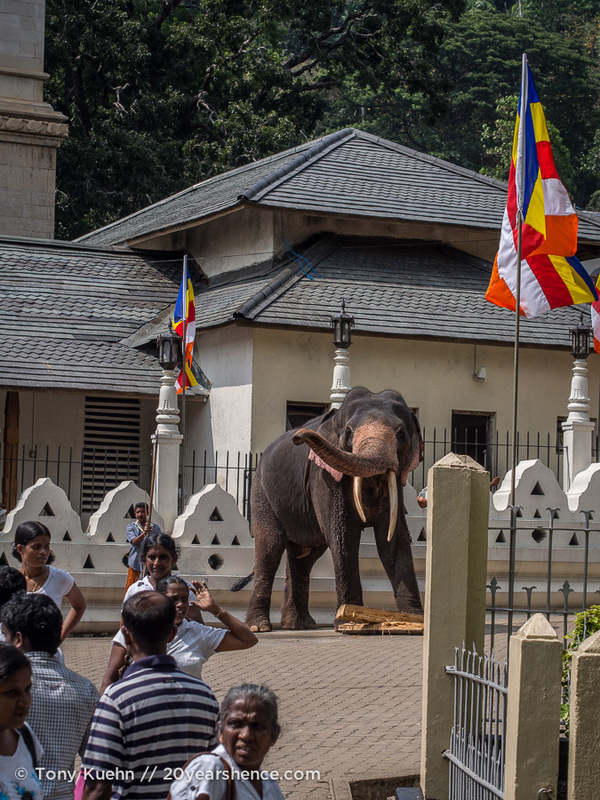 Given that one of Kandy’s primary attractions is the Temple of the Tooth, one of the country’s holiest shrines, which is purported to house a tooth from the Buddha, it’s hard to imagine a better place to witness this celebration. 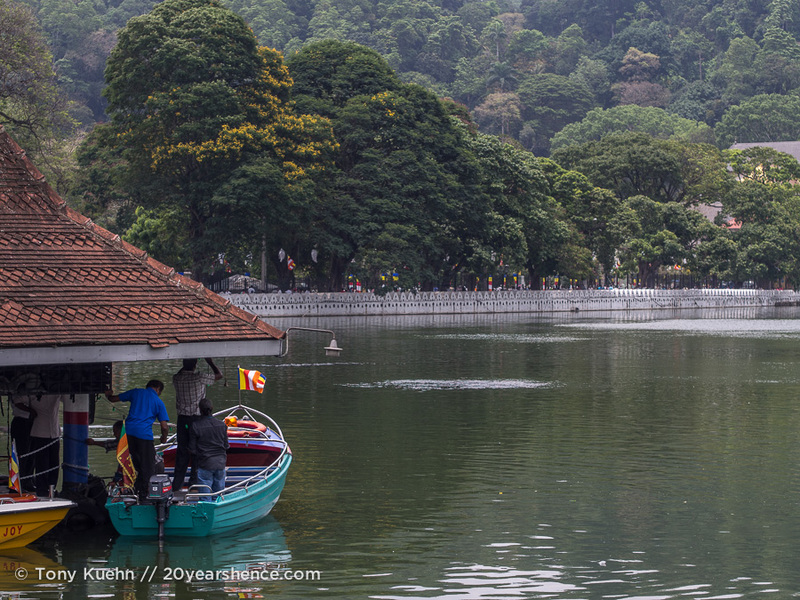 I have to think that Kandy would be a beautiful city to visit, no matter the time of year or the occasion. 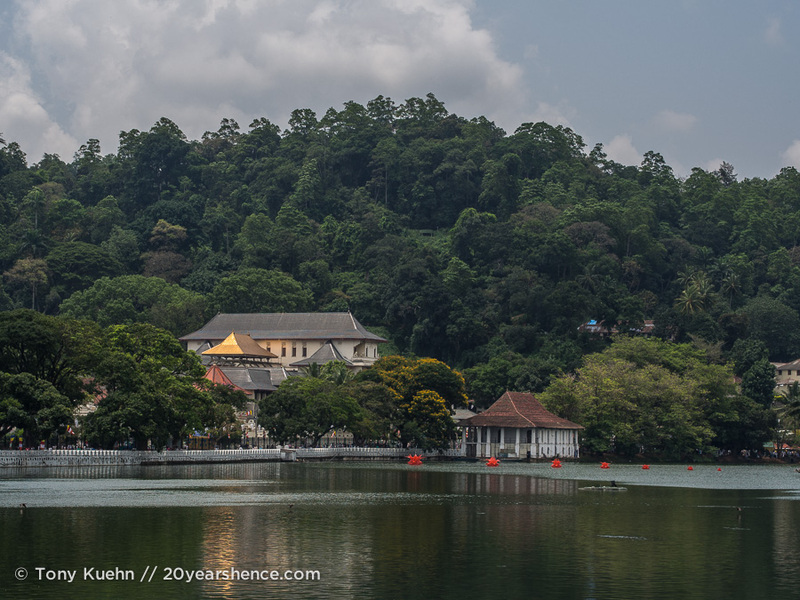 A gorgeous lake at the center of town forms the cornerstone of the city, and its position in Sri Lanka’s hill country means that when the rest of the country is sweltering, the climate here is crisp and cool—perfect for leisurely strolls around the lake and around the center of town. 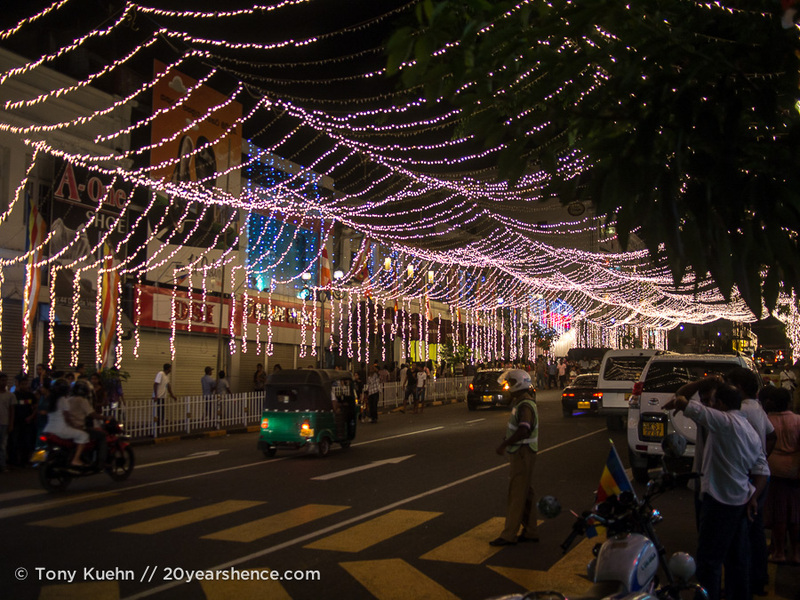 But around Vesak Day, what is already a lovely city transforms into something even more magical. Colorful prayer flags flutter in the breeze and pristine white lanterns (which look just a tiny bit like paper phantoms) are strung around town to complement the devout Buddhists who will dress themselves in white to symbolize Buddha’s death and the purity of the day and make pilgrimages to the Temple of the Tooth. 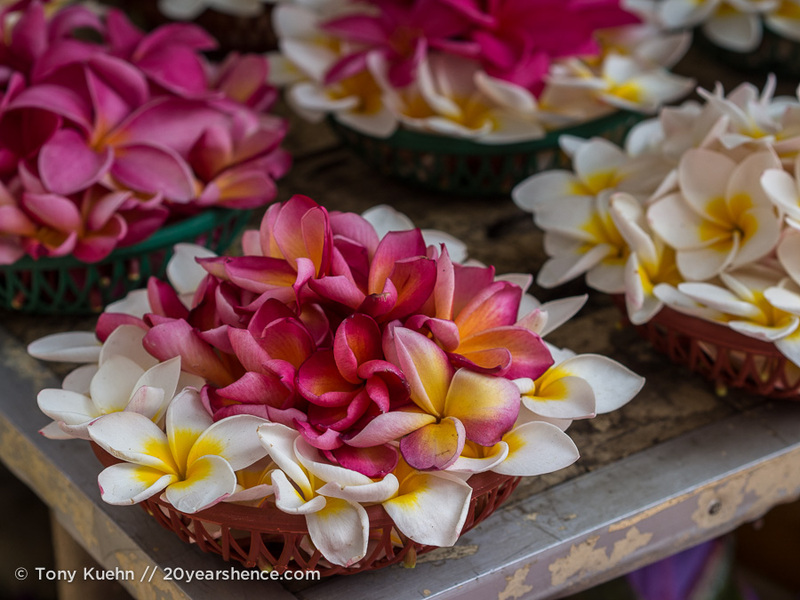 Elephants are brought to the temple grounds, and the most spectacular flower market is set up outside the gates so that fragrant floral offerings are never far from hand. 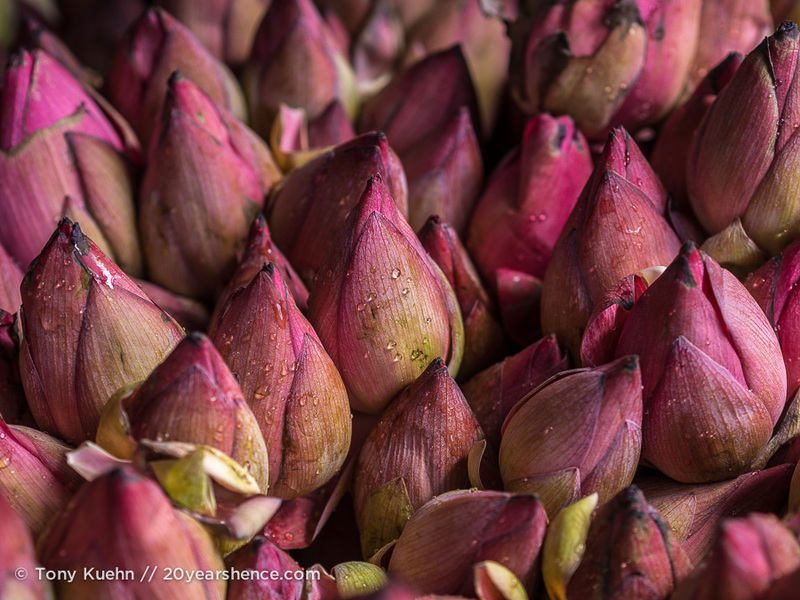 Supremely fitting, I think, since I have already noted that Sri Lanka is the country of beautiful, bountiful blossoms, and now certainly whenever I think of it, one of the first images that comes to mind is flowers. 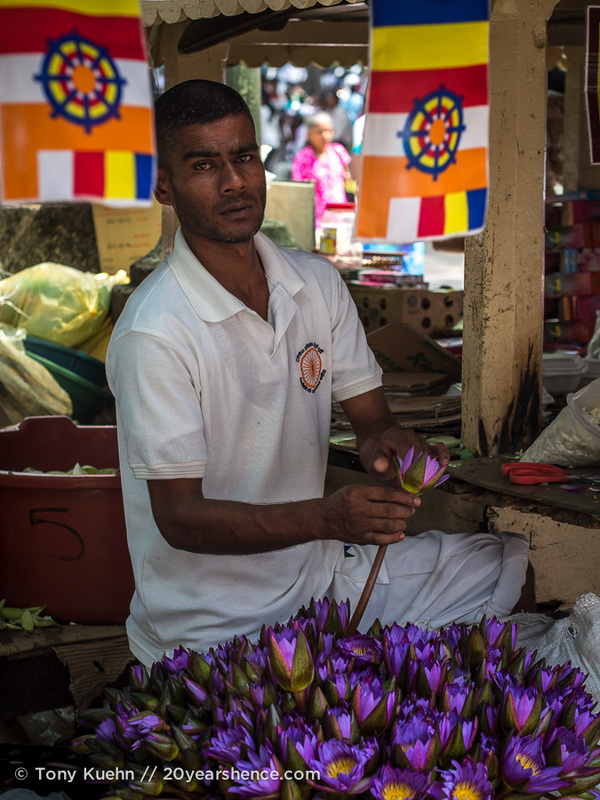 The colors, the delicate curves of the petals, the bouquet of perfume that hung thick in the air… perhaps more than anything else, these are my lingering images of Kandy. I suppose that we should have ponied up the money to actually visit the temple—if ever there were a time, this was probably it—but to be perfectly honest, we were feeling a bit templed out at this point and were perfectly content to simply stroll and be swept up in the tides of people ambling the streets. 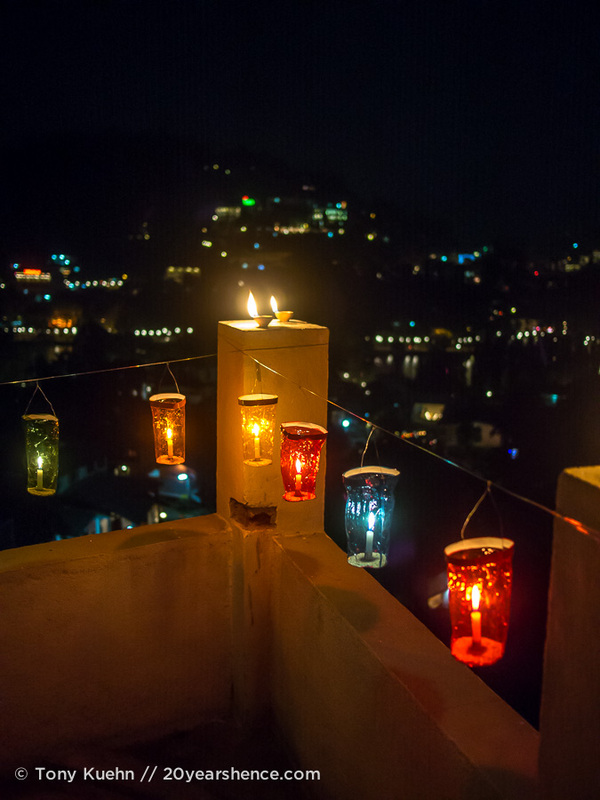 Like most holidays and festivals in Asia, the atmosphere during Vesak Day was lively and bright, and infectious joy thrummed throughout Kandy during our visit. Devotees from far and wide came to town to witness and take part in the festivities: during one of Tony’s treks from our hotel high on one of the hills that overlooks the town, he encountered a dump truck brimming with local men who had puttered 50 kilometers in the dark through the neighboring foothills never breaking more than 15 km/h just to enjoy the atmosphere for a couple of hours before heading home. 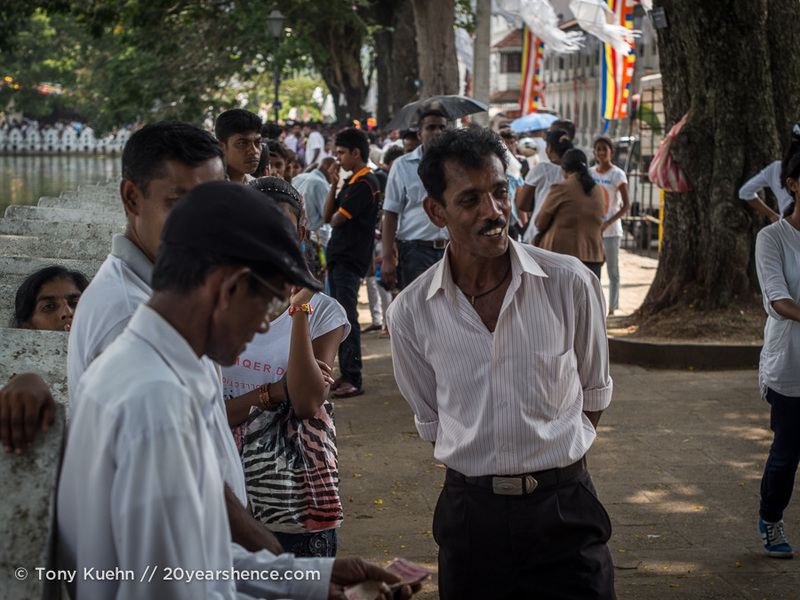 Just like all the Sri Lankans we met throughout the country, they were effusive and welcoming, enthusiastically offering Tony a ride, eager to have an “outsider” take part in the merriment. And because this is Sri Lanka, a country where we never once were at risk of going hungry, there was, of course, so much food. 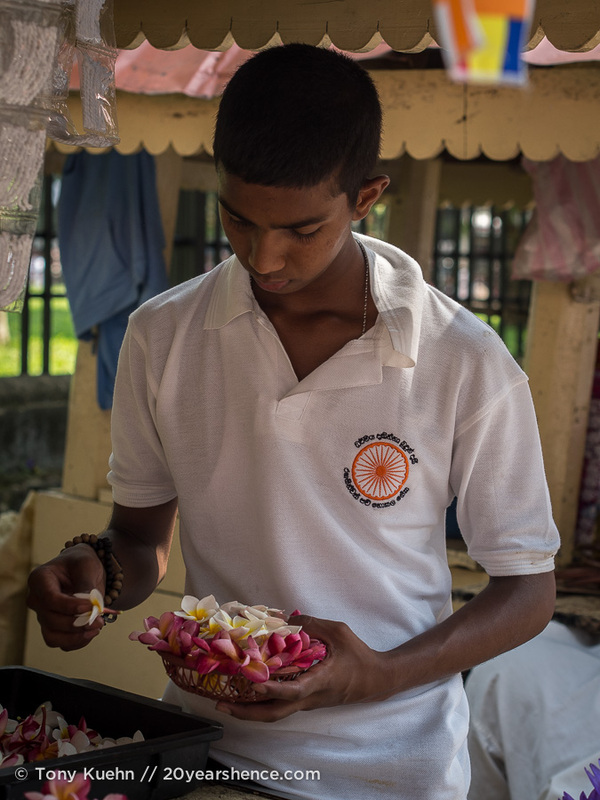 When we asked the owner of our hotel about where to eat while we were in town, he warned us that as part of the Vesak Day celebrations, we would have no issue finding things to eat as, more likely than not, people would simply give it away to any and all who passed. While it wasn’t quite like that, we did enjoy plenty of fresh curd with treacle and free tea during our wanderings around the city and it seemed as though the restaurants where we dined were extra generous in their portions. 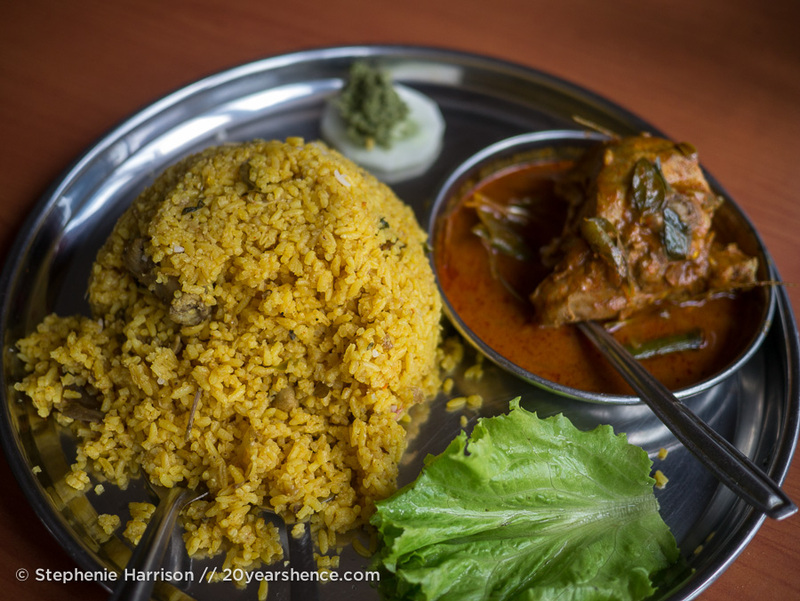 From banana leaf bundles bursting with aromatic chicken biryani, succulent broasted chickens, and spicy chicken murtabaks (oh how we missed you! 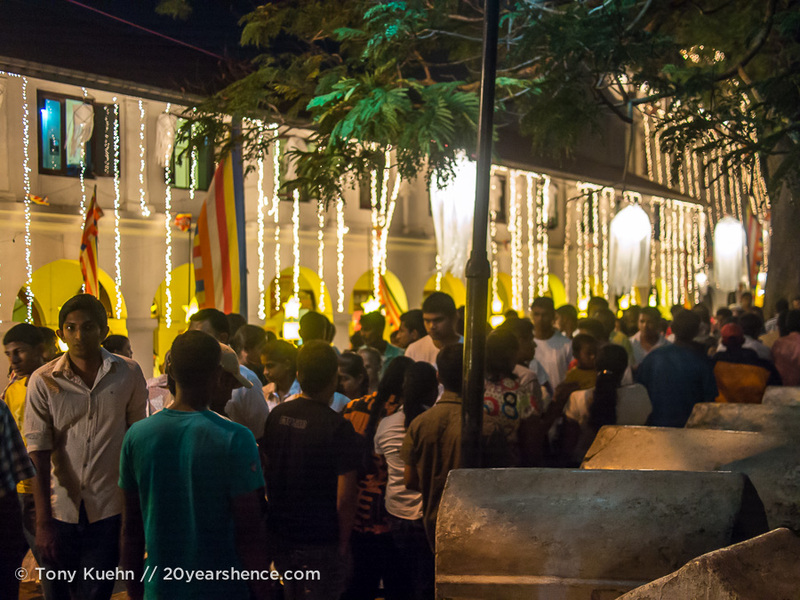 ), I daresay our time in Kandy was a true FEASTival. Much as was the case in the Philippines, with all the natural beauty that Sri Lanka offers, it takes a pretty special city to charm and entice visitors into staying when they could be hiking through tea country or lolling about on some of the world’s best beaches. 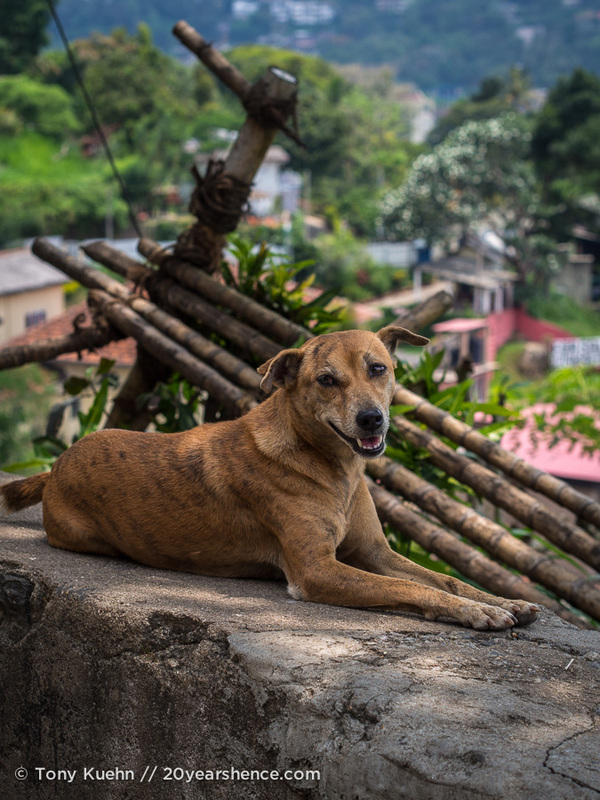 But Kandy was an easy, laid-back place to spend a couple of days and enjoy the gentle ebb and flow of city life, surrounded by culture and history. It’s yet another facet to this fascinating country and although it’s squarely on the tourist trail, the city still feels remarkably chill and generally unconcerned with tourists, which is rare and refreshing in this part of the world. Since I started this post with a pun, it only seems right (in the “so wrong, it’s right” school of thinking) to end with one, too: Kandy, you’re dandy, and we’re sweet on you! wow, thats amazing that you were there for Vesak. Jealous. Although The temple is always so festive and colorful, looks like the rest of the celebration was a pretty amazing thing to experience. I have no doubt the Temple of the Tooth is always decked out and ready to dazzle, but it was really cool getting to be in the area for Vesak day. We had no idea the holiday even existed prior to our arrival in Sri Lanka either, so it was doubly cool because it was a total surprise. Anotehr beautiful post about a country I am just getting more and more excited to visit!! Oh, the puns. Too funny! Experiencing a destination during a festival or holiday makes for the best experience. I love how happy everyone seems. 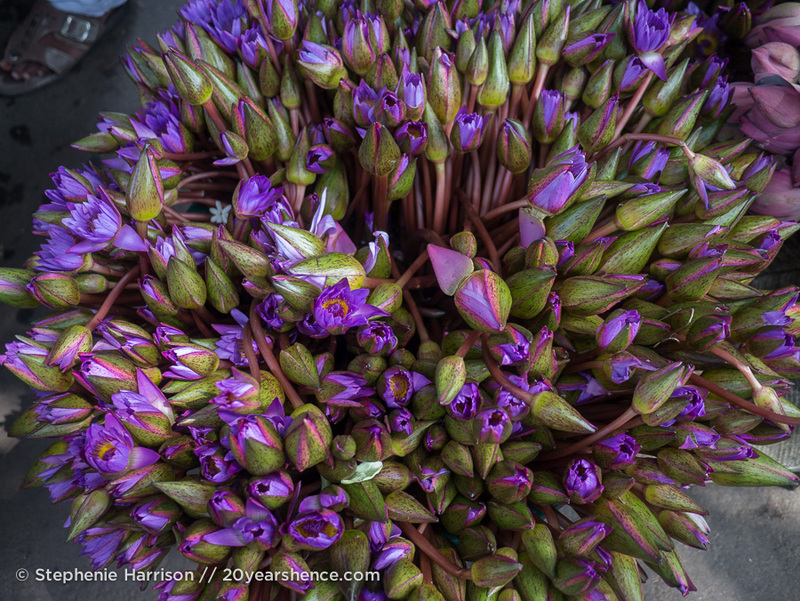 And all those flowers and lanterns…so beautiful! Sri Lankans in general seemed to be friendly, warm and happy people, but Vesak Day was clearly a very special celebration for them and it was so nice to be there for that! Wow, that looks like such a special festival to be in town for! 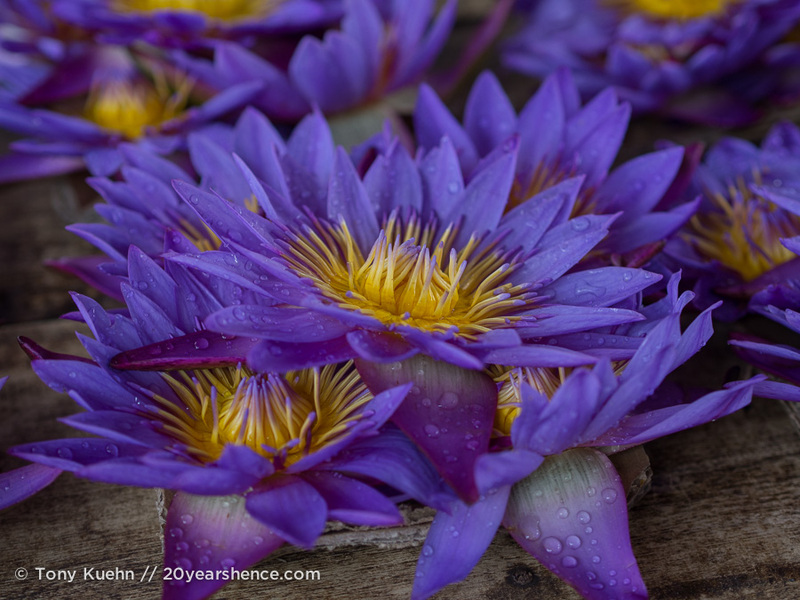 I absolutely love those flower pictures – simply stunning. I can see why they come to mind when you think back on your time there! 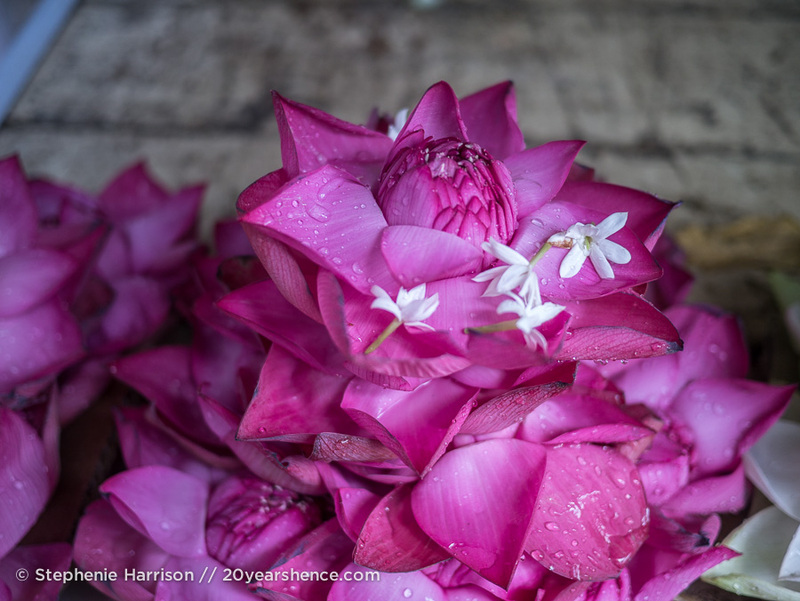 I’m generally not one to be bowled over by flora, but the flowers in Sri Lanka absolutely swept me off my feet and made me swoon. 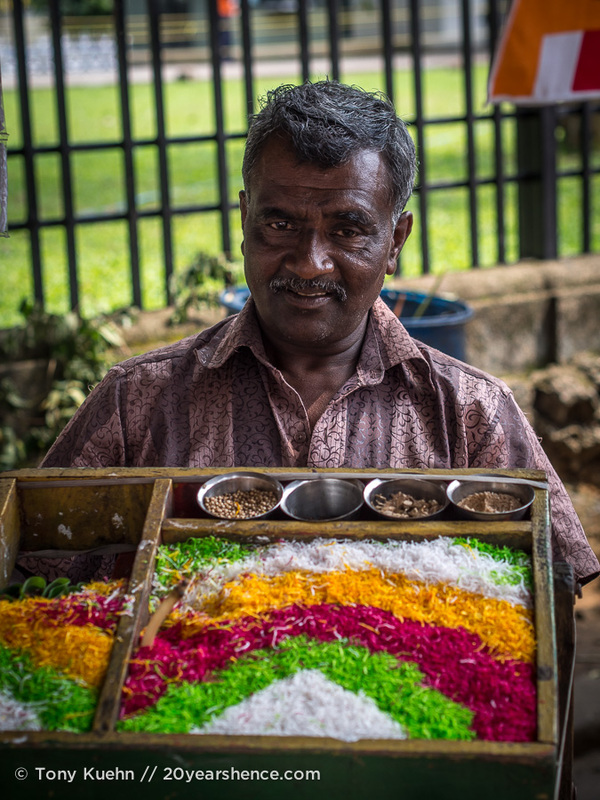 The ones in Kandy were definitely my favorite: so abundant and so colorful! I’m so glad we got to be in town for such a beautiful festival. It’s fantastic that you got to witness and experience Vesak Day, I found traditional festivities to be very interesting and helpful in a way to connect more with the local culture. I’ll never forget when we happened to be in Singapore for Thaipusam, that was pretty special too. I can’t believe you got to be in Singapore for Thaipusam! It looks so gruesome and insane, I would love to get to see it for myself one day… a very different festival to this, I think, but no less fascinating. No pun left undone:) But, it does look absolutely gorgeous. 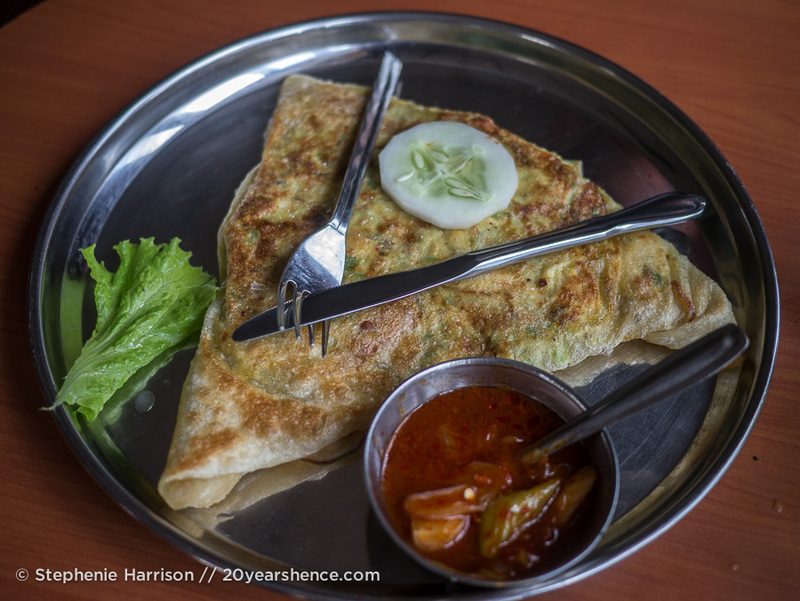 We’re heading for Indian for dinner tonight, and your photos only sparked my appetite more! I feel a bit ashamed that we’ve been back in Toronto for TWO MONTHS and have yet to have any Indian food yet. 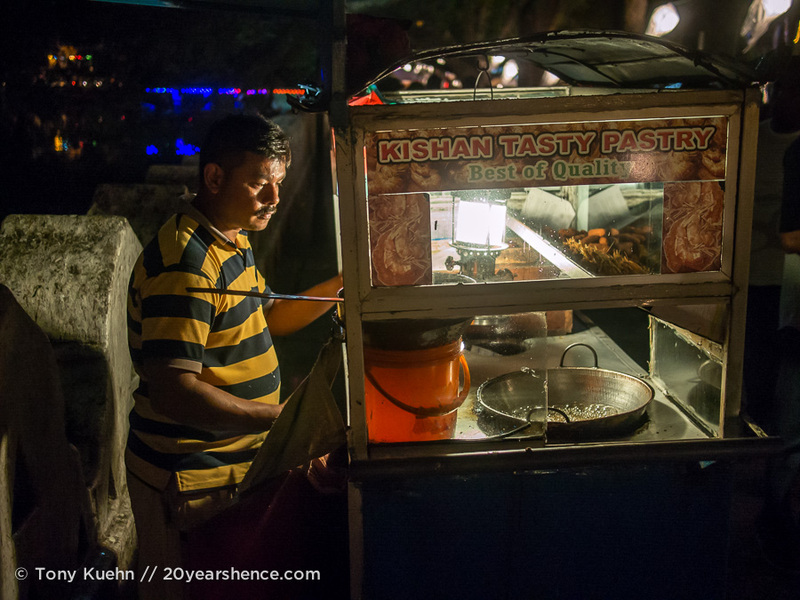 And it’s got some of the best Indian food in the world… must rectify this post haste! “Kandy, you’re dandy, and we’re sweet on you!” Oh God…. Great post though!! 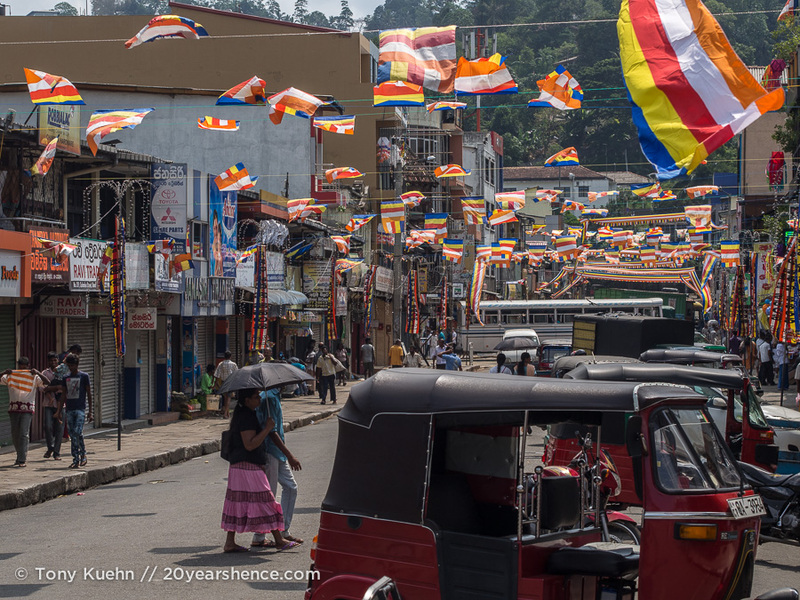 Kandy is a lovely spot, and those colours! Stunning! awesome photos! Love those flowers.. looks so peaceful too. 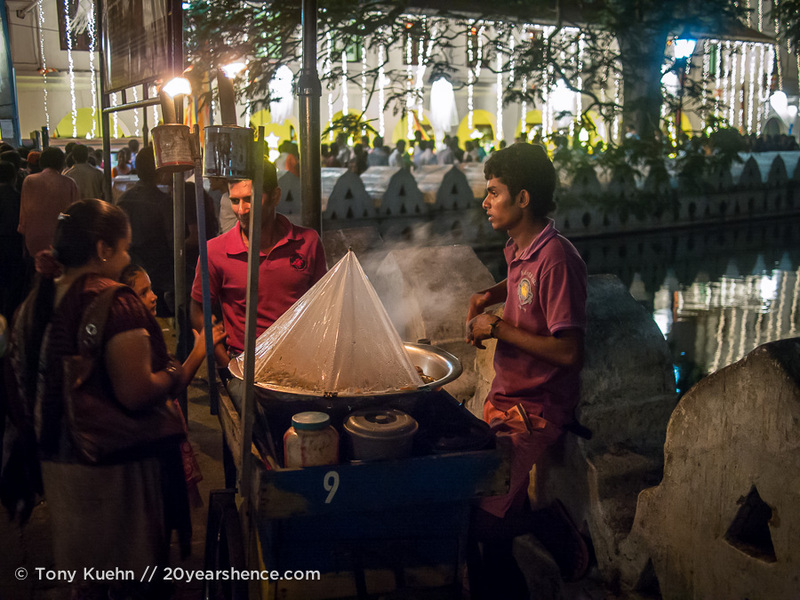 It’s crazy because I really thought SL would be just like Mother India, but it really was incredibly peaceful here, even in the cities which generally are absolute madhouses in Asia. 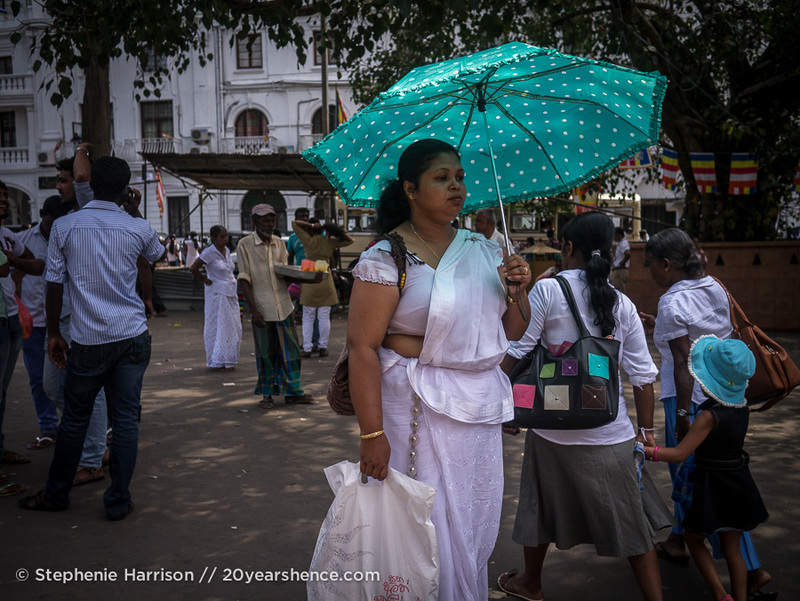 I’m sure I’d find the energy of India electrifying, but the nice thing about SL is that it never felt overwhelming, even during vibrant and hectic festival times. Hi Steph, I’ve read a lot about Kandy and seen many photos but your images showed unique and more intimate scenes of Kandy. I particlularly love your people shots. How nice that you get to spend Vesak Day in this sweet town. I can feel the energy from the festivities. Those flowers are gorgeous, I can see how they would linger in your mind. I laughed when you said you skipped a temple bec you were so “templed out.” I can relate. We’ve done that so many times. 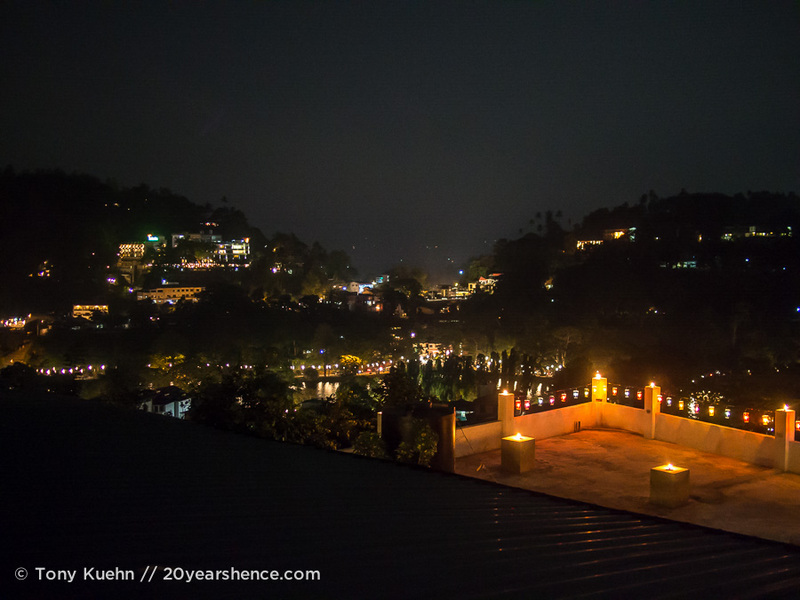 I really do believe that Kandy would be lovely to visit at any time of year, but it was definitely extra special getting to be there when such an important festival was taking place! lol, love those puns! And that’s so awesome that those guys offered Tony a ride! I’d heard of Kandy but really knew hardly anything about it. It seems like my kind of place! Karyn @ Not Done Travelling recently posted..Quiz: How Much Do You Know About Endangered Animals? 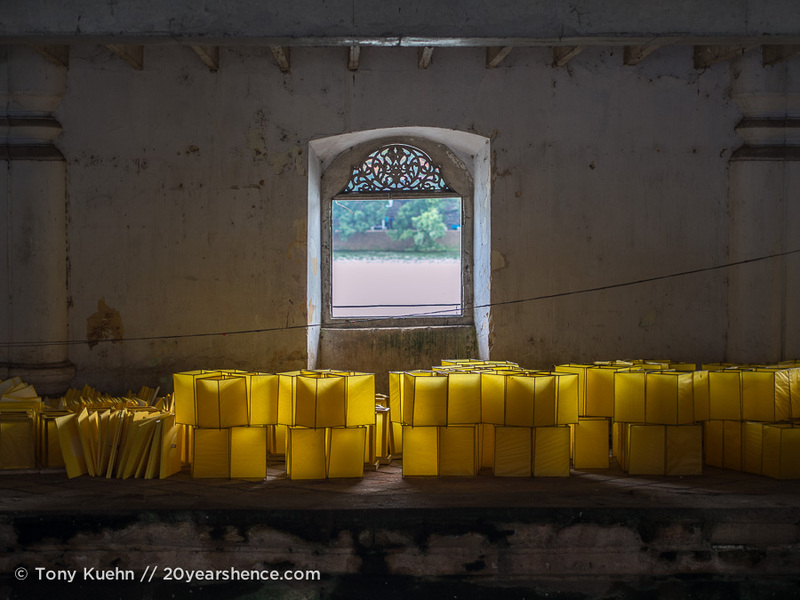 Despite having read a fair deal about Kandy too, we also had no real idea of what to expect. 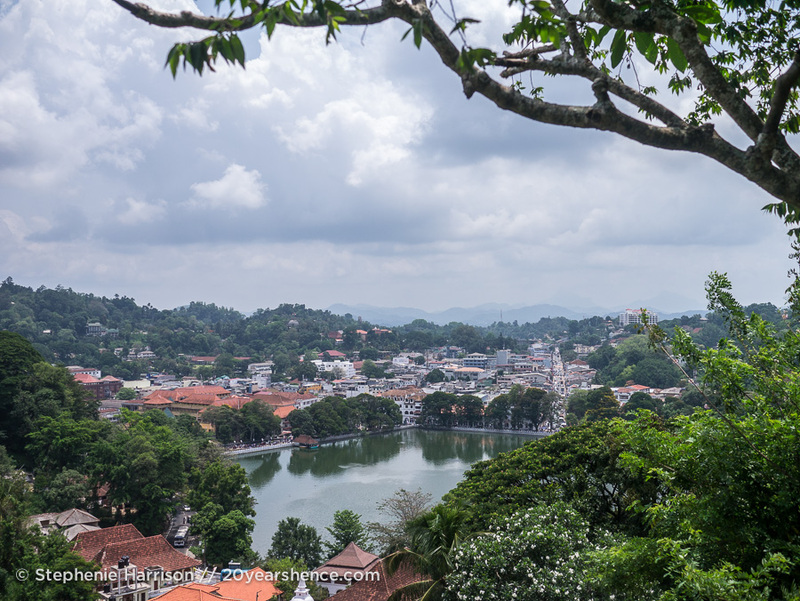 To be perfectly honest, we did not have high hopes for the cities in Sri Lanka (as it is the rare Asian city that we really enjoy), but I have to say, Kandy was a delight (much like the island as a whole!). I want more posts from Sri Lanka! And more pictures too! Love how you’ve both captured the life with your photography, it just makes me want to hop on that plane. If only we could give you more posts, but alas, our time in SL was limited and we were only able to visit so many places (but how many places they were!) in 3 weeks. Rest assured, we’ll definitely be back to SL one day, and will have a whole new slew of adventures to share with you… but I also hope that you’ll make it there yourself and will be able to share some of your own adventures with us! Kandy really does look dandy! I love the festival shots (did you guys specifically plan to be in Kandy for it, or did it just sort of pan out that way?). 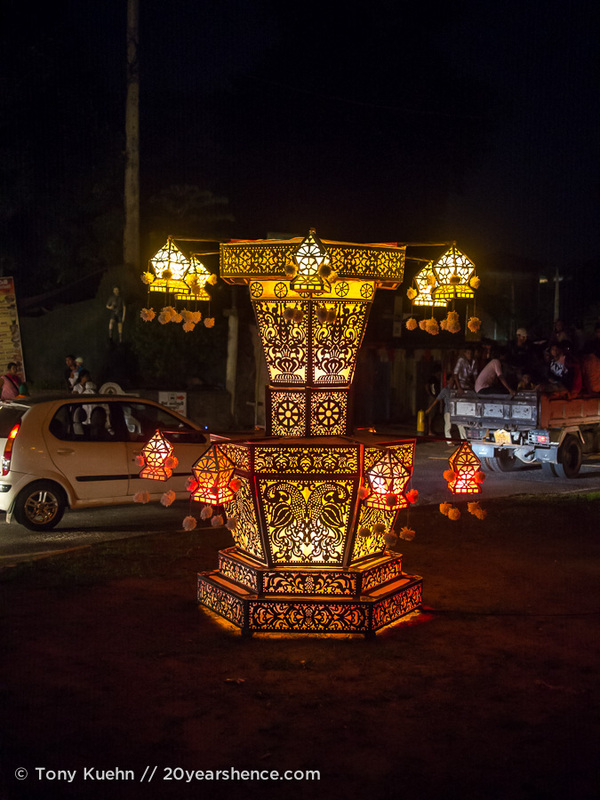 We did not specifically plan to be in Kandy for Vesak Day, in that we didn’t even know the festival existed before landing in Sri Lanka! Once we knew it existed, we vaguely had an idea that we might be there for it and it seemed a good place to aim for, but we wouldn’t have been super disappointed if we had celebrated elsewhere. Still, I’m glad things worked out as they did. I love the pictures of real local people doing ordinary everyday things. Amazing photos! Victoria@ The British Berliner recently posted..3 days in Bangkok: A walking tour isn’t what you think! You’re right, I think Kandy would be marvelous to visit any time of year. But I’m adding this festival to my ever-growing list! 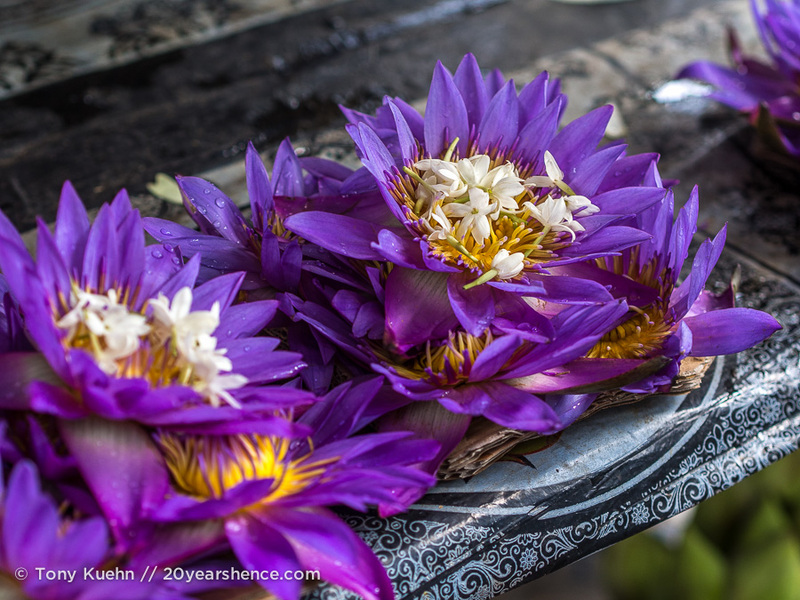 After partaking in Thailand’s Loi Krathong, I want to chase festivals around the world. They can be so much fun! For a while we tried to avoid festivals when traveling just because they seemed to make things more expensive and kind of a hassle… But, I think starting with how awesome Songkran was in Thailand, we’ve had a change of heart and have started to see the fun in these national holidays once more. I hope you get to experience Vesak Day for yourself some day!